Nothing of the old Balachadi camp site stands, except for two water tanks, a banyan tree and, at a distance, the summer house of the Jam Saheb. The entire campsite is now part of a 300-acre Sainik school. Whatever remained of the barracks where the Polish kids were housed came down during the earthquake that struck the area in 2002. Human memories are few too: The local villagers and doctors who knew the children have all passed away. However, there are two plaques, one big and one small, that tell an ongoing story. 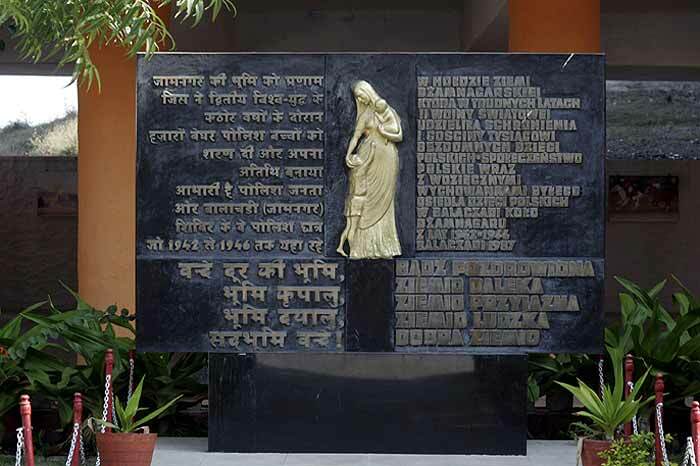 The big plaque, cast in bronze, with a mother and two children, one in her arm and one at her feet, symbolises mother India, dealing with her own problems, yet not shying away from tending to a Polish child. Sculpted by a Pole, Z. Korpalski, it was unveiled in 1989 when the Polish president visited India. Behind the gesture was the Jamnagar Club, formed in the late 1970s by former Balachadians, now scattered across the globe. They met once in two years and later merged with the Indo-Polish Friendship Society. The smaller plaque on the site is about Polish contributions to the post-earthquake reconstruction of the hospital and pathology lab on the former campsite. In February 1985, a year after the Polish government permitted foreign travel, a few ‘Balachadians’ came here to connect with their childhood. After the Gujarat earthquake, they came together to help their adopted town, raising money and sending it to local authorities. Subsequently, the Polish government sponsored a waterworks project for the ravaged Jamnagar town, which was completed and opened in 2002.